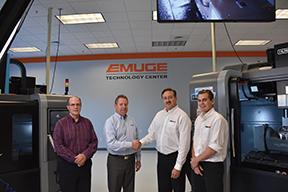 TOLLAND, CT, Dec 13, 2016 – CNC Software, Inc., developers of the manufacturing industry’s leading Mastercam CAD/CAM software, announced it has established a partnership with Emuge Corporation, a leading manufacturer of high performance taps, drills, end mills, and other rotary tools. For more information on the Emuge-Mastercam partnership, contact Mastercam at 671 Old Post Road, Tolland, CT 06084, Tel: 800-228-2877, www.mastercam.com or Emuge at 1800 Century Drive, West Boylston, MA 01583-2121, Tel: 800-323-3013, www.emuge.com. Over 10,000 types of cutting tools and accessories are stocked in the company’s U.S. and Canadian Headquarters located in West Boylston, MA, U.S.A. 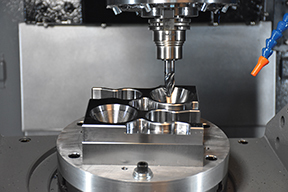 The 21,000 square foot state-of-the-art facility includes a new technology center with a machining and tooling demonstration showroom and classroom, tool reconditioning manufacturing, warehouse, sales, support and administrative offices. For more information, visit www.emuge.com.